"Field of Dreams" Actor Dwier Brown Scheduled to Appear April 5th! El Paso - March 13, 2019 - "If you build it, he will come" and he is coming to El Paso! 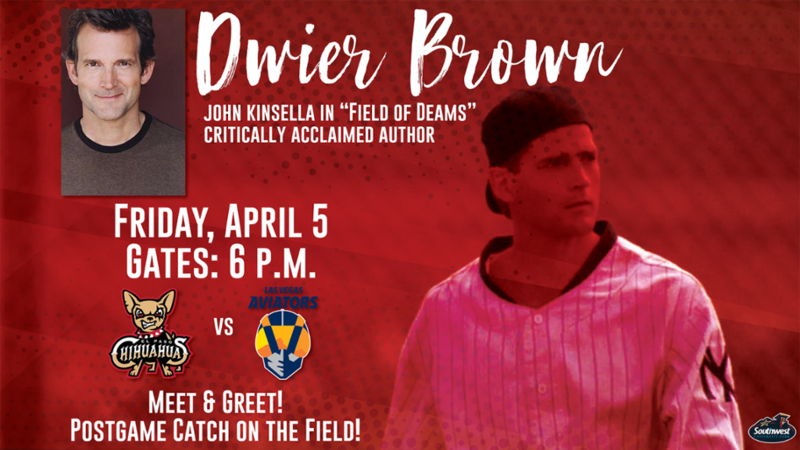 Dwier Brown, who played John Kinsella in the iconic baseball movie "Field of Dreams," is scheduled to appear at the Chihuahuas game vs. the Las Vegas Aviators (Oakland A's affiliate) on Friday, April 5, 2019. Gates open at 6 p.m. and first pitch is slated for 7:05 p.m.
Brown's appearance is a part of the Chihuahuas 30th Anniversary Celebration of the "Field of Dreams" movie release. As part of the festivities, guests will have the opportunity to meet Brown on the concourse during the game and as well as play catch with the actor postgame. Both experiences are on a first come first served basis. "It was while in El Paso shooting a movie in 1985, that I fell in love with Minor League Baseball," Dwier said. "The atmosphere, the proximity to the players, and the fun I had there reminded me 'of all that was good about America, and could be again.' I am so happy to be returning to El Paso to pick up the fun where I left off and to answer the question, 'Is this heaven?' with the obvious answer, 'No, it's El Paso.'" "After seeing and hearing Dwier as the keynote speaker at last year's Minor League Baseball Promotions Seminar, we knew we had to invite him to a Chihuahuas game," said MountainStar Sports Group Senior Vice President and General Manager Brad Taylor. "People here will appreciate his enthusiasm and love for baseball." Including "Field of Dreams," Brown has 59 acting credits to his name and is also the author of the critically-acclaimed book "If You Build It … A Book About Fathers, Fate and Field of Dreams." ***SPOLER ALERT*** "Field of Dreams," released on May 5, 1989, is a movie about an Iowa corn farmer, Ray Kinsella, played by Kevin Costner, who hears voices telling him "If you build it, he will come." Kinsella interprets this as a message to build a baseball field in his corn fields. After enlisting the help of an author and building the field, the ghosts of the 1919 White Sox team begin to play on the field. It is not until the end of the movie when he realizes the field was to be built for his father, John Kinsella. As part of the night's celebration, the Chihuahuas are offering a Field of Dreams Package in the Budweiser Bullpen Patio. The ticket includes a private meet-and-greet with Brown, a 90-minute all-inclusive buffet and one person will be selected at random to throw out a ceremonial first pitch. Fans can enter-to-win three tickets as part of the Field of Dreams Contest! The contest includes three tickets to the Field of Dreams Package, an autographed baseball and an autographed copy of Brown's book. Fans can enter at my.epchihuahuas.com. The 2019 season kicks off in El Paso on April 4 versus the Las Vegas Aviators (Oakland A's) at Southwest University Park. The five-game homestand includes Field of Dreams Night as well as 70's Night with a fireworks spectacular (April 6), Kids Day Sunday featuring an appearance by Curious George (April 7), and concludes on Monday, April 8 with a mini bat giveaway presented by Southwest University. Individual game tickets are on sale now! Guests can purchase at epchihuahuas.com/tickets, by calling (915) 533-BASE or by visiting the Southwest University Park Box Offices on Durango St. and/or Santa Fe St. The box offices are open 9 a.m.-5 p.m. Monday through Friday.